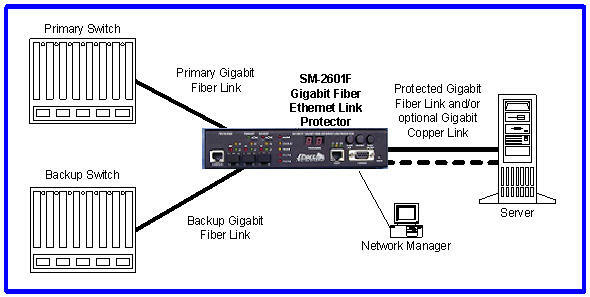 The SM-2601F Intelligent Fiber Link Protector® provides a fully managed automatic link backup capability to "mission-critical" 1000BaseSX or 1000BaseLX Fiber Ethernet links. Protects vital connections to servers, routers, and other key devices that require fail-safe operation. The SM-2601F operates by monitoring a "primary" link and, in the event of a failure, automatically switches to the backup link. The Link Protector® does not require any additional network cards in a server and does not require router-level switchovers if a failure occurs. The backup link can be connected to either another port on a switch or an entirely different switch for greater protection. The unit contains a dual Mode Protected Port (one LC Fiber and one RJ45 Copper) for a redundant station port configuration. The unit also functions in a back-to-back configuration for redundant cable path applications.